WiMAP-4G is a standalone RF planning tool implemented in Java. It requires only a standard PC with no special configuration, preferable with Windows OS. It supports 32bit as well 64bit OSs. logging window, link-budget table, cursor location etc. Planning of any radio network needs the knowledge of the radio technology, the available transmit units and its possible configuration and - last not least - the area to cover. Therefore WiMAP-4G has several options to integrate this knowledge into the planning project as pointed out in the three subsections below. WiMAP-4G supports cartesian (UTM, GK) and geographical (WGS84) coordinates. Geographical data is provided typically as raster data (like formats as TIFF, GIF, JPG or PNG) or as vector-orientated data (DXF: AutoCAD, Autodesk). For a fast orientation an online access to OpenStreetMap is directly integrated. Topographical data (elevation) is required for every field strength prediction, mainly for detection of "line-of-sight" and for the calculation of reflections and shadows. This data is expected to be available in ASCIIGrid-formats (ARCInfo, ESRI) or basic X-Y-Z lists. WiMAP-4G offers also a direct interface to load SRTM (elevation) directly from the web. Building data is used by the high-precise propagation prediction model CORLA, for considering indoor-loss considerations, and for advanced line-of-sight considerations. The data is expected to be available as MIF-files (MapInfo). Building data can also be generated from vector-orientated data (2.5D - building data) and vice-versa building data can be used as maps. Also manual creation and download of building data via OpenStreetMap™ is supported. The location images are georeferenced images that contain coordinate information (tags). They can easily imported in WiMAP-4G and are directly shown within the map on its tagged co-ordinate position. WiMAP-4G supports the import of location images as .jpeg-files. It is possible to browse and to rotate through multiple images from one location. WiMAP-4G supports several current radio technologies, like GSM, UMTS, LTE, WiMAX, WiFi. A particular focus is on site-to-side and last mile technologies, e.g. WLAN based on IEEE 802.11 (a,b,g,n,ac) or on Micro-wave technology. WiMAP-4G supports the opportunity to edit and create different technologies in a very flexible manner. Variable channels on different bandwidth can be attached to each technology. Hardware types are used to model access points, base stations, or similar hardware for creating sites or clients in a project in an easy and flexible way. Radio units and antennas are parts of this modeling and allow to work with MIMO, diversity, multi-band structures. Documents (e.g. antenna diagrams, technical information etc.) may directly be stored within WiMAP-4G's projects. Receiving units can be represented as any pixel in a 2D-calculation visualization or as dedicated objects as "points" or "clients". Points are characterized by its coordinates and its receiver height. It is possible to calculate the receiving level for each point or even for a subset of them and to export it in a csv-formatted file. For last-mile networks (fixed-line substitution by wireless) often outdoor antennas with significant antenna gains and high receiver heights are used. WiMAP-4G supports the planning of such scenario with the help of "clients". Apart from "points" these objects are linked to a site and characterized by their hardware types, antenna settings, and supported channels. WiMAP-4G comes with the built-in Free-Space-Propagation, COST-231 Walfisch-Ikegami and Erceg model and has an interface to the industrial-strength ray-launcher CORLA. The Free-Space-Propagation model is primarily based on the elevation model. Optionally it takes into account visibility restrictions regarding the elevation model and the building model. While this model is not well-suited for city centres and strongly cultured regions, it produces good results for suburban and rural regions. It can help you to identify critical regions where detailed measurements should be done. The IEEE 802.16.3c proposes this model developed by Victor Erceg for WiMAX planning. It is designed for suburban - urban areas and considers three Non-Line-of-Sight (NLoS)-scenarios - A, B and C.
ITU-R P.1411-3 is a semi-empirical model based on COST 231 Walfisch-Ikegami and enhanced by ITU-R. The model considers detailed input data like average height and separation of buildings, street data (width, direction), BS and MS antenna height, length of the path covered by buildings as well as distance from BS to MS.
CORLA - a Cube Oriented Ray Launching Algorithm - uses a discrete cube based representation of the supplied area that leads to a fast identification and processing of diffraction and reflection sources. Different antenna patterns, delay spread and building penetration are inherent features of the algorithm. With the help of the various prediction models a planned network can be analyzed in detail without having it deployed. In particular different planning versions can be compared and modified, re-calculated and optimized with the help of different visualization methods and topics. For different network types the required methods differ a lot. While for mobile networks areal predictions are most important, last-mile networks rather require detailed methods to investigate the single links to customers' premises. The site-to-site prediction is a special case of the link-budget calculation. For any initial antenna (might be many) the power level to any other antenna of the same carrier and within a suitable range is calculated and visualised as a coloured line, and are shown as tool tips. This is in particular helpful for planning mesh-networks and infrastructure networks on top of the access layer of a radio network. The terrain profiler is designed to support the analysis of point-to-point connections and for line-of-sight analysis. It considers terrain heights (elevation) on the path and building data, transmitter and receiver heights. It is combined with the distance and angle measurement tool. Start and end points may snap to the nearest object (e.g. a site antenna or a client, or point), taking the configuration of the start and end objects where it snaps to into account. These start and end objects are also directly considered in the link budget calculation which makes planning of dedicated links fast and easy. By point field strength calculation the exact field strength and power level for each point on the map is calculated. The points tab in the Project-Explorer shows all points used in the current project. This table can easily be exported and used for further analysis steps. To discover the total power received on a point for a channel the power channel sum can be calculated. Its results are also available in the table mentioned before. Point coverage calcualtion - like the claculation for clients - are always based on areal predictions. 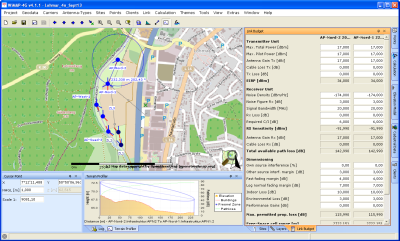 Frequently networks designed with WiMAP-4G and its calculation results have to be exported to 3rd-party tools like GIS-applications and map tools. This may be done for post-processing or presentation to other project stakeholders. WiMAP-4G is very open in interfacing to other tools. Data and results can be imported and exported in various standard formats. The most universal formats are ASCII-Grid defined by ESRI and KML created by Google. For text based results like point coverage values csv-format (comma-separated-value) is supported. WiMAP-4G offers the export of areal visualization results and of path loss prediction data in ASCII-Grid format. This format is supported by most of al GIS-tools. It carries a geographical reference which helps to map it easily to the right location within the psot-processing application. For presenting calculation results to others - customers or regulatory offices - the easiest way is to integrate them in map tools by Goggle (Earth or Map). Calculation and planning data prepared for Sites or Antennas as well as for points - in particular also data from measurement campaigns - can easily be imported and exported to and from spread sheet tools like Excel in csv-format.